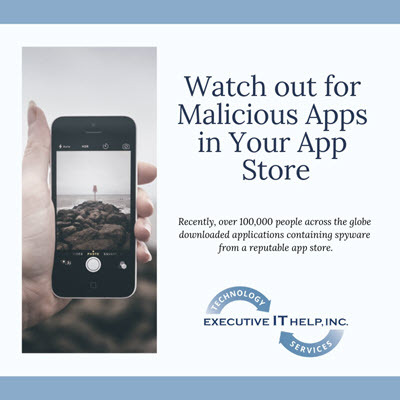 The bad guys are developing malicious applications with the hopes of making their way into your mobile device’s app store –and sometimes they’re successful. Recently, over 100,000 people across the globe downloaded applications containing spyware from a reputable app store. According to researchers, this spyware steals personal information like your call logs, contacts, photo and video files, and can even use pop-ups in an attempt to steal your login credentials for accounts like Google and Facebook. Do your research: Read app reviews, but make sure they’re not fake or staged! Be wary of applications that don’t have any reviews. Avoid applications that have a low number of downloads. Look for strange logos or spelling errors in the application’s description. Consider investing in cybersecurity protection for your mobile device. When in doubt, avoid downloading questionable applications, and look for a safer alternative.